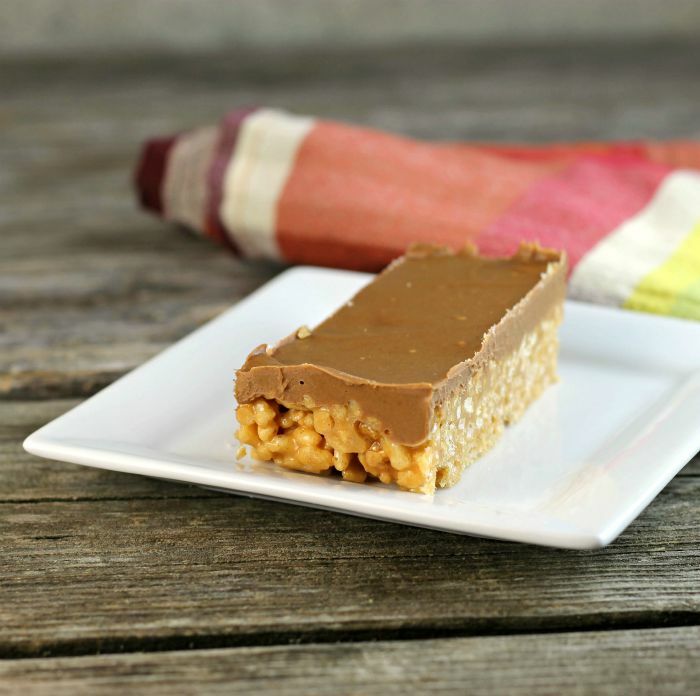 Peanut butter Rice Krispie treats are one of the bars that I grew up on. When everyone else was making Rice Krispie treats with marshmallows, my mom was making her bars with peanut butter, sugar, and corn syrup. Let’s face it when the summer’s hot weather rolls in who wants to turn on the oven. Yeah, really a hot oven is not something that is enjoyable in the summer. So, when summer rolls around it is nice to have recipes that don’t require turning on the oven. 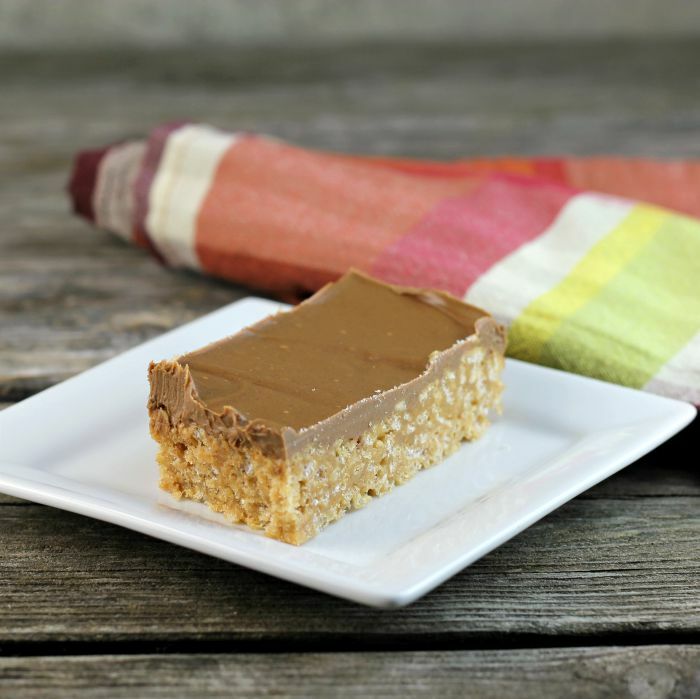 That is one of the reasons I love this peanut butter Rice Krispie treats recipe. But the peanut butter and chocolate are a couple more good reasons that I love these bars. These are as simple to make as the marshmallow ones. Well, maybe even a bit easier because you don’t have all that sticky melted marshmallow clinging to everything. And really they may take less time than the marshmallow do. No waiting for the marshmallow to melt. This is how the peanut butter Rice Krispie treats are put together. In a heavy saucepan or a Dutch oven combine the sugar and the corn syrup, bring these two ingredients to a boil. Once these ingredients are boiling remove the pan from the heat and stir in the peanut butter. Once the peanut butter is mixed in stir in the Rice Krispies and pat bars into a pan that has been greased with butter. See how easy that is! The frosting is just as simple all you do is combine chocolate chips, butterscotch chips, and peanut butter. Melt these three ingredients together and spread over the bars. That is all it takes to make these yummy treats. 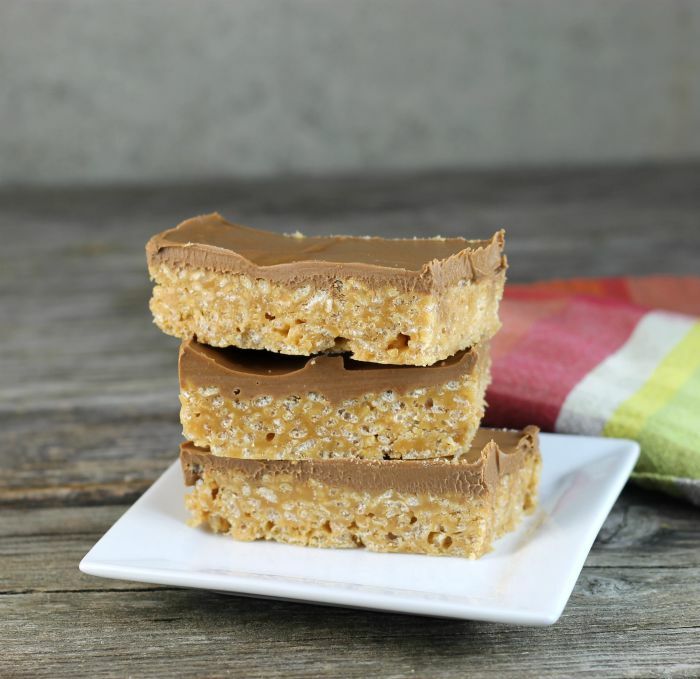 Peanut butter Rice Krispie treats, there is no baking involved, which makes them perfect for summer. In a heavy saucepan or Dutch oven stir together the light corn syrup and sugar. Over medium heat bring to a boil. Remove the pan from the heat and stir in the peanut butter until smooth. Add the Rice Krispies and stir until combined. Pat the mixture into a pan that has been greased with butter. While the bars are cooling add the chocolate chips, butterscotch chips, and peanut butter into a saucepan. Over medium to medium-low melt the ingredients together. Stirring continuously until the ingredients are melt and the mixture is smooth. Spread over the bars and cool completely. Now this is a calorie bomb, but they look delicious and tempting! They look yummy! I’ve never made them with PB so have to try it! Thanks! Would never have thought of these! But they look wonderful — terrific idea. Thanks! YUM! These look fabulous! Bars like this probably don’t stick around long, huh?! 🙂 Have a great week! Yummy! They look so crispy, perfect as an afternoon snack or dessert. We used to make these growing up but I love this version so much better with the peanut butter and chocolate. What a great idea! I do love traditional rice krispie treats, but the addition of peanut butter here sounds quite tasty. I’ll have to keep this one in mind for sure. Thanks for sharing!! 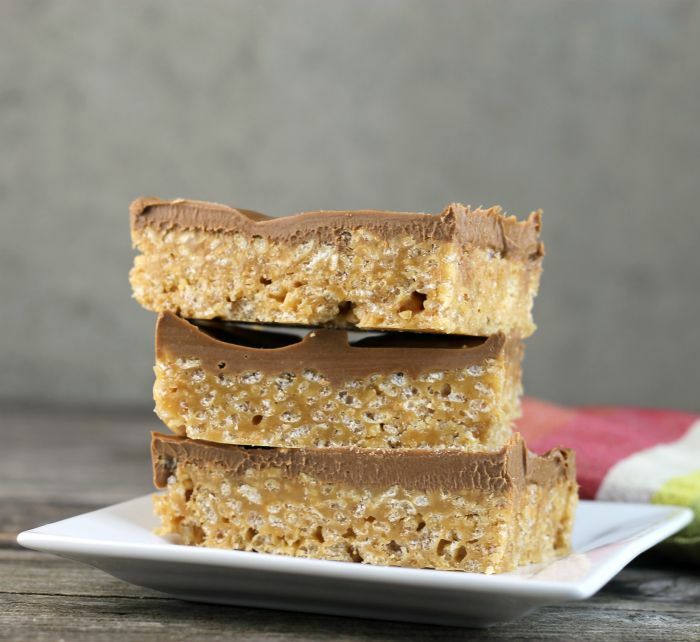 How much rice krispies is used in this recipe. Hi Jackie, thank you for catching that. There are 5 cups that go into the rice krispies recipe. Sorry for not having it correct in the recipe. Hi Jeanne, I use a 9 by 13-inch pan for this recipe. Thank you for asking.